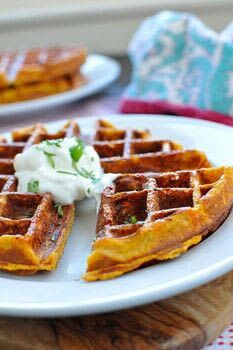 Cheesy Sweet Potato Waffles w/ Sour Cream & Maple - for a holiday brunch or a quick and filling breakfast, lunch or supper any time of year. Preheat waffle iron to med-high heat. Remove peels from sweet potatoes and add to a large bowl. Mash with a fork until smooth(ish); then add egg whites, sour cream, water, brown sugar, olive oil, thyme and salt. Stir until well-combined. Stir in baking mix until incorporated. Let batter sit for about 5 minutes. Mixture will be somewhat thick. 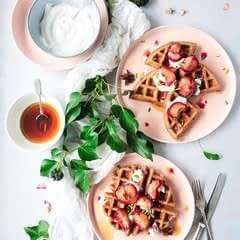 Grease waffle iron with oil, butter, or nonstick spray. Pour about 3/4 cup of batter on iron, quickly spreading mixture with a spatula, if necessary, leaving a 1″ border. Top waffle evenly with 1/4″ shredded cheese. Close iron and cook until your little waffle gadget beeps or about 4 minutes. Waffle should be a deep golden brown. Top generously with sour cream and maple syrup. Feeling fancy? Mix the two together! Note: To make the sweet potatoes, preheat oven to 400F. Toss or rub halved sweet potatoes generously with a glug of olive oil. Salt liberally. Place cut-side down on a baking sheet lined with parchment or silpat. Bake for 25-40 mins, depending on the potato size, until very tender and a fork is easily inserted. Allow potatoes to cool enough to handle, or refrigerate for up to 2 days.